Vijay’s Mersal promises Diwali to be a spectacular affair. The film happens to be one of the most anticipated Tamil films of the year with Thalapathy Vijay not doing a double but a triple role in the film. The actor will be taking on three roles set against different time periods, and that is a good reason to be excited. There remain only 10 days for Thalapathy’s Mersal, and upping the excitement, the makers have yesterday released two promos of the film on TV and on social media. The promos were released along with the Baahubali 2: The Conclusion's TV premiere on Sunday night. Thus, Mersal; starring Vijay, SJ Suryah, Samantha Ruth Prabhu, Kajal Aggarwal and Nithya Menen; has once again getting the trend mills buzzing. While the teaser gave us a glimpse of his three roles in the film - a panchayat head, magician and doctor, the promos give us a closer look at two of the female leads of the film - Samantha, Kajal and also introduce us to one of his roles, pitted as a panchayat head. The film is extra special because it’s the 100th film bankrolled by Sri Thenanadal Films and also marks the second collaboration between Atlee and Vijay. Their last movie happened to be Vijay’s biggest hit ever. This brings up a lot of expectations when it comes to Mersal. A grand audio launch was organised in Chennai where AR Rahman, the composer behind Mersal’s amazing music which was performed live. Soon after, the Mersal’s teaser was unveiled, which racked up 10M views in 24 hours. The first promo, with 'Macho' as the BGM, shows us in a giffy about Samantha and Kajal's edgy and chirpy roles, Kovai Sarala's comic timing and the female lead's chemistry with Vijay. But this one has got no traces of Nithya Menen who is paired opposite Vijay in the rural setting of the film. However, this half a minute promo gives us a glimpse of Vadivelu. The cult comedian is set to enthrall the audience along with Vijay after a long gap. The second promo is one for the fireworks. 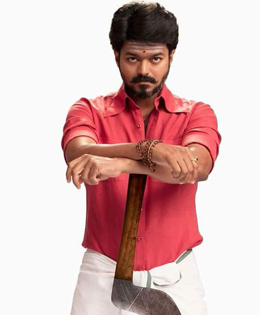 Vijay kills it in just 30 seconds of his appearance, as a mass Tamizhan from the rural parts of Tamil Nadu (a rustic jallikattu setup) and trademark Ilaythalapathy punch lines, which sure will leave fans excited.